Somerville, Mass – A brass band marched by, or rather, danced by, followed by a dozen crazy-talented hula-hoopers. Twin V clapped for the flag-waving Veterans for Peace. Twin S got happy feet. Honk! is a festival of street bands, most of whom are playing for a cause. They play to protest, to celebrate and mostly to have fun. As it says on the festival website, it’s a “spectacle that is radical and subversive without being militant or sanctimonious.” That’s what Somerville is all about. We didn’t actually participate in much of the festival, due to other obligations, but there are a handful of kid-friendly events. On Friday evening, there was a lantern-making workshop, followed by lantern parades through Somerville’s neighborhoods. On Saturday there was an Instrument Petting Zoo, where kids could test out the sounds. And all day long, there was music, on six stages, all around Davis Square. 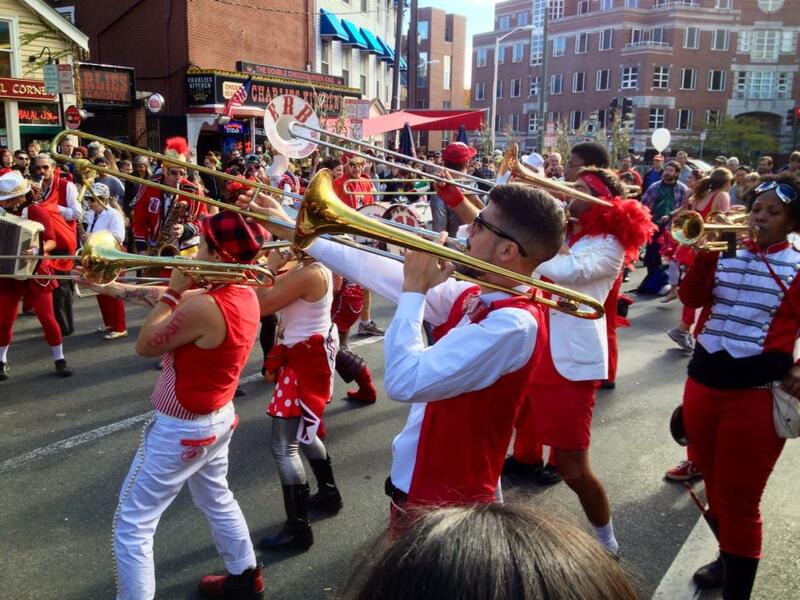 On Sunday, the festival culminated in the Honk! Parade, which runs from Davis Square to Harvard Square. “Reclaiming the Streets for Horns, Bikes and Feet.” This is what we saw today. All of the bands participated (30-plus), as well as dozens of community organizations. The twins watched with rapt attention as puppets, stilt-walkers, dancers, roller skaters, unicyclers, dragons, birds, vampires, and many other creatures paraded by. Not to mention the music. The music is diverse and dance-inducing and downright awesome. Daddio is absolutely right. We can’t move (even though we are busting out of the 1200-square-foot pink house). Some things are more important than walk-in closets. Thanks to my friend Lois Josimovich for sharing her wonderful photos.